I have substituted Japanese ramen with Chinese egg noodle (wanton mee) in this dish and have also added hard-boiled egg. 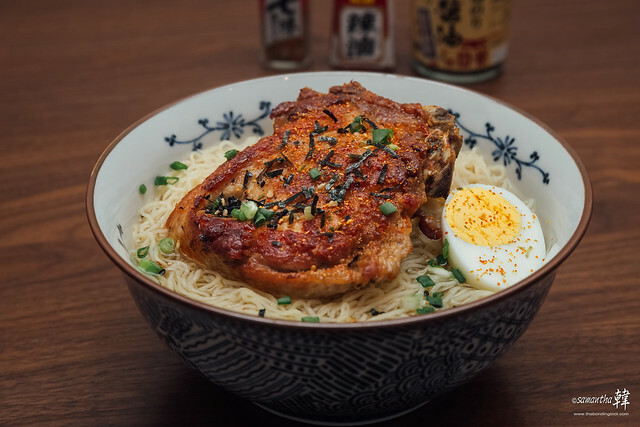 The pork chop ramen I had in Tokyo had no egg. Pork Chops (1 per person). Egg Noodle (1 bundle per person). A splash of Hua Tiao Chiew or Japanese Sake, optional. A few drops of Sesame Oil, to lightly coat for sheen and nutty taste. Mis en place for Egg Noodles with Pork Chop. 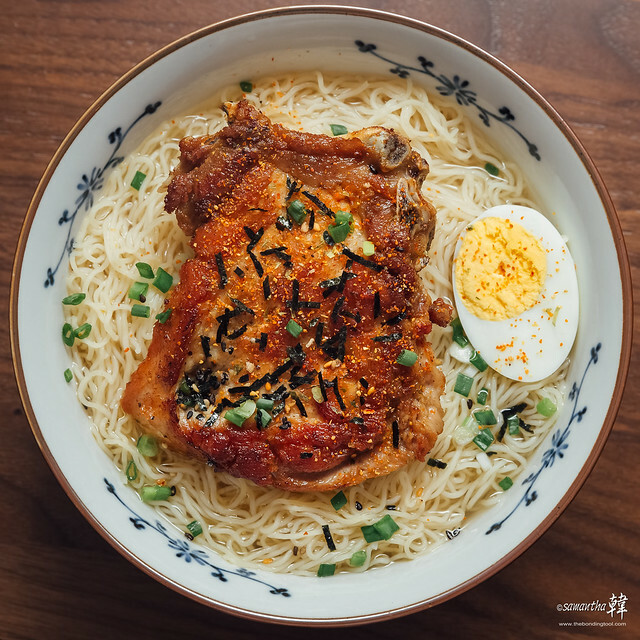 Pork Chops, Chicken Eggs, Spring Onions and Dried Egg Noodles. Hard-boiled Egg, cut into halves. A handful of Beansprouts, blanched briefly. 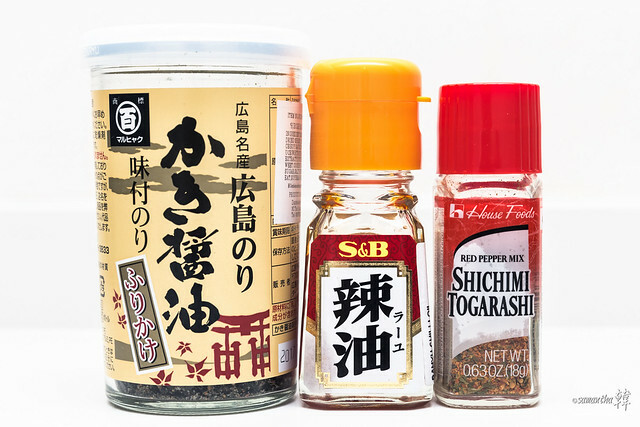 Shichimi Togarashi (Red Pepper Mix). Seaweed Strips & Sesame Seeds. Japanese Chilli Oil (S&B La-yu). But I have served it as a one-bowl meal. Stock Ingredients: (good for 3-5 bowls) OR you can use packaged Clear Chicken Broth (i.e. Swanson’s) easily available in supermarkets. 1 kg Pork Bones (best use leg bones or kah tang kut in Hokkien or any soup bones will do) or Chicken Carcass. 1 big Onion, peeled and cut into quarters. 3 slices Ginger, skinned and sliced thinly. 3 cloves Garlic, peeled and crushed lightly. 3 stalks Leeks, cut into two across its length. Soy Sauce, Japanese Sake (rice wine), Salt and Sesame Oil. 1. Bring plenty of water to a boil. Add the pork/chicken bones and bring back to a boil on high heat for 3-5 minutes. 2. Drain the bones into a colander and rinse them well under the tap, making sure no bloody bits remain or the stock broth will be cloudy when cooking. 3. In a clean pot, put in all the stock ingredients and set to medium heat on stove. 4. Just before the water comes to a boil, turn the heat down to low and simmer slowly. Be careful not to let the soup come to a furious boil. Keep skimming off the fats and scum when necessary to ensure clean, clear stock. 5. Simmer for 2 hours (up to 4 hours if you have time) until the stock has reduced to half. Season with soy sauce, sake, salt and sesame oil to taste. The stock is now ready for use. Heat pan with a little vegetable oil and pan-fry the pork chops till fully cooked and golden brown on all sides. 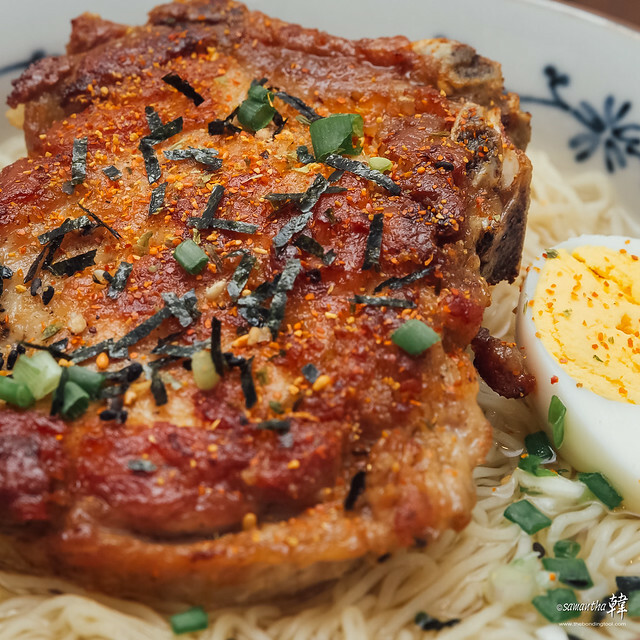 You may opt to serve the pork chops and noodles separately. Boil noodles accordingly to manufacturer’s instructions. Drain in colander and divide noodles into individual bowls. Ladle hot stock over noodles. 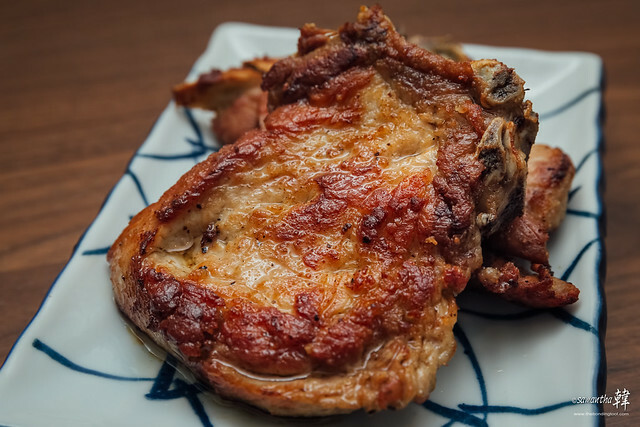 Place a piece of the pan-fried pork chop and serve immediately. Let the diners garnish with condiments according to their taste. Let the diners garnish with condiments according to their taste. You can make the stock in advance. Re-heat gently and season to taste on day you are using. Play around with different noodles and soup base (try miso, shoyu or shio, etc…). ← Our Breaking Fast Bonding Meal During Ramadan From Pu3!